The adoption of the global time standard caused almost 20 minutes to completely vanish from Toronto clocks. Before time was standardized around the world, Toronto’s public clocks, such as the one at St. Lawrence Hall, were set based on the position of the sun observed at the Toronto Observatory at University College. Photo from the Toronto Public Library, E 9-234. The approximately 17-and-a-half minutes between 11:35 and 11:52 a.m. on November 19, 1883, didn’t officially exist in Toronto. 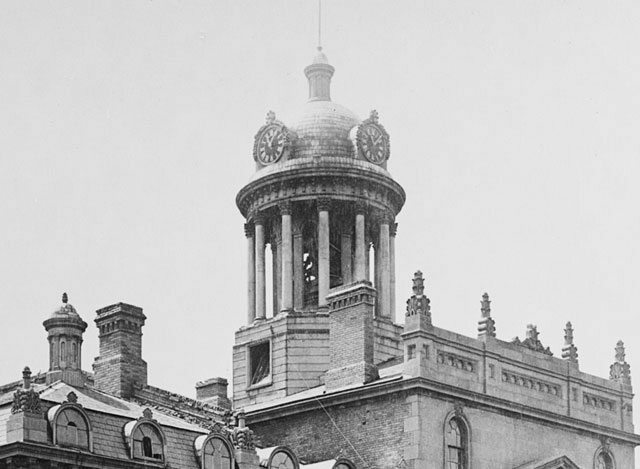 When the time reached 25 minutes to noon on that day a little over 133 years ago, the city’s public clocks at St. Lawrence Hall, Osgoode Hall, Union Station, and at various fire stations quietly skipped almost 20 minutes ahead. This was the day the Toronto switched to standard time, abandoning forever its own hyper local time calculations in favour of a system synchronized with towns, cities, and countries around the world. Remarkably, and quite improbably, the origin of this chronological shift lies in a typographical error in a train timetable in the 1876 Official Irish Travel Guide. Sandford Fleming, a prominent Scotland-born surveyor and railway engineer whose skills guided the Canadian Pacific through the Rockies, was attempting to travel from a friend’s home near Sligo to the port at Londonderry, where he would sail to his home town of Kirkcaldy. He arrived at his first destination without incident, but things went awry during the return leg to Londonderry. Fleming would later recall arriving in the seaside town of Bundoran on the west coast of Ireland in time to catch the 5:35 p.m. train only to be told that, no, the schedule should have read 5:35 a.m. Disgruntled but helpless, Fleming spent the next 12 hours in the station waiting room alone with his thoughts. As time passed, he became increasingly fixed on the idea of a 24-hour clock as a way to make the time of day easier to write down and understand. Why should the day be split into two sets of hours numbered one through 12 when the numbers one to 24 would work just as easily? The bigger problem, however, was how railways and towns calculated the time of day. In 1876, practically every city set the time of day based on the position of the sun. While that worked perfectly well at the local level, it meant even neighbouring communities operated on different times. A notice published in the Globe newspaper outlining the official procedure for the setting of clocks based on the observatory time signal. People often became confused by similar signals from local fire halls. From the Globe, October 23, 1871. In Toronto, the magnetic observatory at University College was in charge of setting the time. In the 1870s, as the sun approached its peak, the observatory sent a time signal to local fire halls, which in turn sounded their bells to indicate 11:55 a.m. This system enabled people to approximately synchronize their clocks and watches across the city. Jewellers offered a similar timekeeping service. The clocks at J. G. Joseph & Co. at 56 King St. E were kept in line with the reading at the observatory so customers could set their watches. With the development of the railways and faster means of travel, the flaws in this method of keeping time became painfully apparent. Travel east or west 20 kilometres and the precise time of solar midday, the time when the sun is highest in the sky, moves by a full minute. The sun peaks in eastern Scarborough approximately a minute earlier than in downtown Toronto, for example. Get on a train in 1871 and things get confusing very quickly. Fleming liked to use a journey from Halifax to Toronto with stops in St. John, Quebec, Ottawa, and Montreal as an example: “At the beginning of [the traveller’s] journey, he sets his watch by Halifax time,” wrote Fleming biographer Lawrence J. Burpee in 1915. 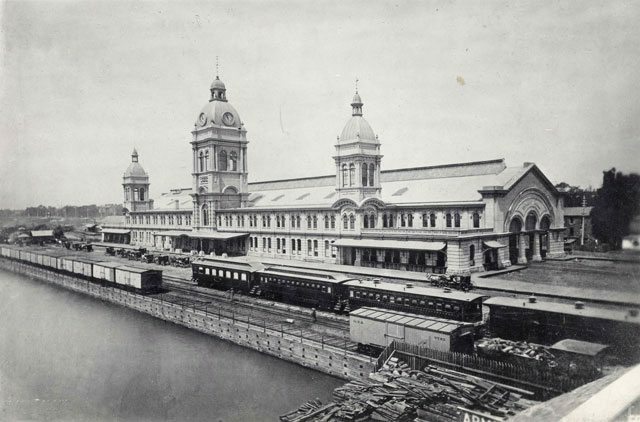 The clock at Toronto’s first Union Station, shown here in the 1870s, was a critical timekeeping instrument used to set the watchers of arrivals by train. Photo from the Toronto Public Library, E 1-24c. Fleming recommended what is now the international date line in the middle of the Pacific Ocean to prevent countries squabbling over where the prime line should fall. All the towns and cities within a particular zone would operate on the same time, regardless of the local variations of sunrise, sunset, and the time when the sun was highest in the sky. Each time zone would be assigned a letter of the alphabet and watches and clocks would indicate the time zone in which it was currently the noon hour, allowing anyone to know the time in any other world city at a glance. The clock would also be divided into 24 hours for ease of understanding. “This change would certainly be a blessing to travellers using a number of times and going long distances,” wrote the Globe. Fleming attempted to deliver his paper at the British Association for the Advancement of Science meeting in Dublin in 1878, but was unceremoniously bumped from the schedule. Despite this setback, Fleming’s ideas were well received by the British Royal Society, the Canadian Institute, and the American Meteorological Society, with the latter two forming a joint committee of delegates to promote standard time at the International Geographical Congress in Vienna in 1881. Fleming delivered his concept in person on September 21, 1881, and the same year the American Meteorological Society persuaded U.S. president Chester A. Arthur to convene an international convention on the subject in Washington, D.C., two years later, in 1883. While not completely original (others had devised similar systems of international time standards), Fleming’s ideas began to gain traction among academic and scientific societies in Britain, Europe, Russia, and North America thanks to his tireless lobbying. The American Society of Civil Engineers and American Society for the Advancement of Science appointed Fleming chairman of a Special Committee on Standard Time and sent out a questionnaire to prominent North American scientists, engineers, and railway officials in an effort to find a consensus on exactly how standard time should work. Some of the questions touched on precisely how many time zones the North American should be divided into, while others asked for input on how the hours of the day should be labelled. One of the three options proposed giving afternoon hours letters instead of numbers, but it was quickly pointed out chiming “A” or “B” o’clock via bells was weird and difficult without some kind of code. “If a labouring man begins work at 10 and ends at W, how many hours does he work,” wondered the Globe. This (much enlarged) notice appeared in the Globe newspaper in the days before Toronto switched to standard time, advising how the 17-minute advancement in the clocks would be made. From the Globe, November 14, 1883. All the swirling ideas began to coalesce in 1883 when the International Geodetic Association officially recommended the observatory at Greenwich in London, England, be the prime meridian to which all times would be connected. Toronto, five time zones west of Greenwich, would be exactly five hours behind Greenwich Mean Time. In October that year, ahead of most others, many of the North American railways officially adopted standard time on their schedules and station clocks. A month later, the city of Toronto followed suit. 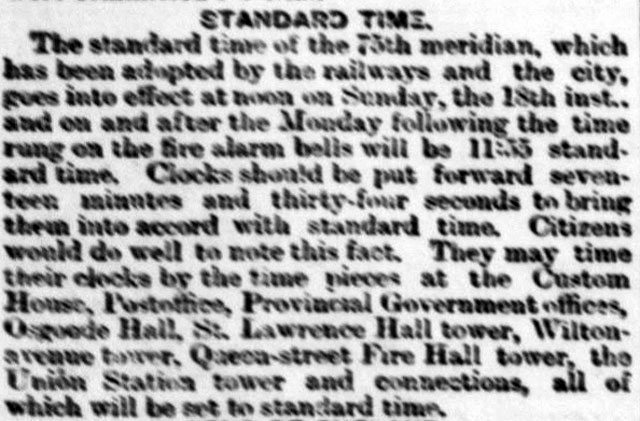 “The [standard time] scheme has now assumed a practical shape, and will come into operation on a large number of railways in the United States and on the Grand Trunk Railway of Canada on November 18th next,” wrote Charles Carpmael, superintendent of the meteorological service of Toronto, in a letter to Toronto City Council. A motion to adopt Carpmael’s advice was passed unanimously on October 29, 1883. 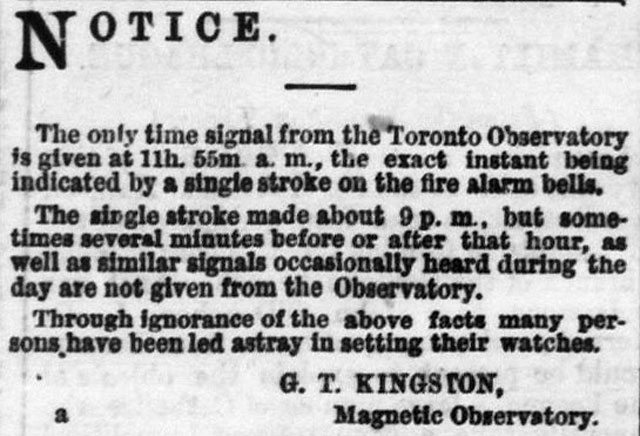 Using the old method of observing the position of the sun, the time in Toronto was 17 minutes and 34 seconds behind standard time, and so a correction was necessary. A notice appeared in the Globe and other local newspapers explaining on November 18 the new time system would come into effect. The next time signal from the observatory, on November 19, would be the first made at 11:55 a.m. standard time, or 11:38 a.m. under the old system. Although Toronto was on standard time by the end of 1883, it would take decades before the world was fully synchronized. U.S. president Chester A. Arthur’s Prime Meridian Conference didn’t convene until 1884, but the representatives of the 25 countries who attended agreed to recommend standard time to their respective governments. The delegates also decided the beginning of the day should be at midnight at Greenwich and that time zones should be counted east and west from the prime meridian, dividing the Earth into eastern and western hemispheres and placing the international date line in the Pacific Ocean, away from large population centres. By 1890, just 14 years after Fleming missed his train in Ireland, the United States, Canada, Mexico, Great Britain, Sweden, the countries of Central Europe, and Japan were using his system of standard time and the rest of the world would follow in the years after. “A great but noiseless revolution,” in the words of the Globe. Additional material from Time Lord: Sir Sandford Fleming and the Creation of Standard Time by Clark Blaise, 2000; Sanford Fleming, Empire Builder by Lawrence J. Burpee, 1915; and the September 8, 1849; June 30, 1857; October 23, 1871; May 30, 1882; October 30, 1883; and the November 14 and November 17, 1883 editions of The Globe.